Chocolate Rocks! It’s time for a well deserved treat after a hard day’s work. Time to pamper that special person or people in your life. Time to make someone’s day even better. Time for gathering friends around the table for a night of games or great conversation. Whatever the time, make the time to prepare this decadent dessert and savour the flavours. This dessert is great paired with a nice cup of tea, fresh brewed coffee, glass of red wine, scotch, whisky, or bourbon on the rocks. Even a tall glass of cold milk! Chocolate goes with pretty much every full-bodied beverage. Here are a few different ways to make this your brownie, special! This cake is amazing without the icing and a nice dusting of cocoa on top instead. Serve warm from the oven with a nice scoop of ice cream on the side or a dollop of crème fraiche, a tiny drizzle of chocolate syrup and a sprig of fresh mint would definitely sophisticate this simple cake recipe. 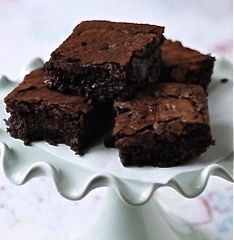 Make a huge gooey brownie by topping it with the frosting while it is still warm. Here’s an idea… Share immediately with a friend and two forks on the side. Preheat oven to 350 degrees. Beat together butter and sugar until smooth. Add eggs, one at a time, beating well after each. Mix in vanilla. Stir in flour, cocoa and salt. Fold in pecans. Pour batter into well-greased oblong or square cake pan. Bake 25-30 minutes. Cool or serve warm from the oven if omitting the frosting. Beat all ingredients together until smooth and thick. If frosting is too thin add more icing sugar. Spread thickly on cooled cake.